The sharp realities of financial globalization become clear during crises, when winners and losers emerge. Crises usher in short- and long-term changes to the status quo, and everyone agrees that learning from crises is a top priority. 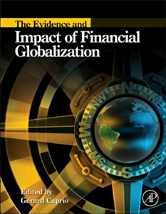 The Evidence and Impact of Financial Globalization devotes separate articles to specific crises, the conditions that cause them, and the longstanding arrangements devised to address them. While other books and journal articles treat these subjects in isolation, this volume presents a wide-ranging, consistent, yet varied specificity. Substantial, authoritative, and useful, these articles provide material unavailable elsewhere.